It looks like Nintendo's latest Mario game, New Super Mario Bros 2, which is scheduled for release in August, is going for the gold. Literally. The Mario series has always been adding new costumes for the mustached plumber with every game. The previous announcement that New Super Mario Bros. 2 would include a variation of the Tanooki Suit had people wondering if the game would have more to offer. With their latest trailer, Nintendo is showing a shiny new side of the mushroom scarfing Italian. 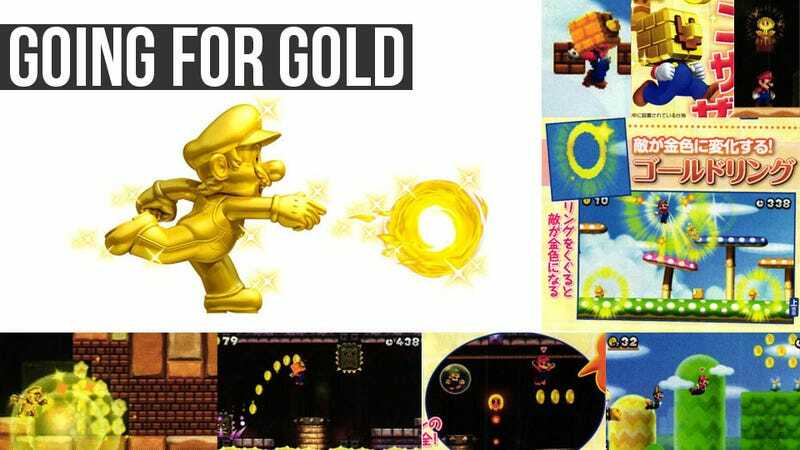 By picking up a gold flower, Mario transforms into Gold Mario, the man with the golden touch. By throwing gold fireballs, Mario can transform ordinary blocks into gold coins. Like other costumes, Mario retains this ability until he takes damage. New Super Mario Bros. 2 puts a heavy emphasis on gathering coins throughout the game. Aside from the Gold Mario costume, there is a Gold Block costume. By putting a special block on his head, Mario suddenly becomes a fountain of gold coins. Mario retains all his normal abilities except that his head is a golden block that gold coins are constantly spewing from. Mario remains in the Gold Block costume until he has dropped 100 coins from his head or he takes damage. A third golden feature is Gold Rings that turn enemies into gold for a limited amount of time. Golden enemies drop bonus coins when they are defeated. Another important feature is the incorporation of co-op play throughout the game. The previous New Mario Bros. allowed for co-op on special stages or for specific minigames. New Super Mario Bros. 2 will allow two players to play together on standard stages as well. A combo attack to damage multiple enemies is possible with two players. For more difficult areas, the game offers a bubble system where one player can encase themselves in an indestructible bubble, keeping them safe from harm while their companion navigates their way through. The latest chapter in the Mario franchise will be available on the 3DS in August.